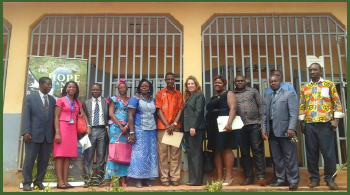 The Regional Office of the Democracy Incubator (DI) Project for the Center Region was launched on the 17th of December, 2014 at the Government Bilingual High School (GBHS) Etoug Ebe, Yaounde. 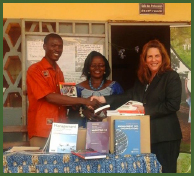 It was presided over by the representative of the US Ambassador to Cameroon (Nancy Schmidt-Jones). 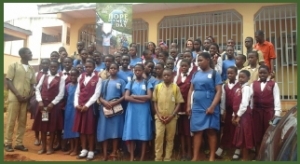 In attendance were staff and students from the various selected schools implementing the project in the Center Region (GBHS Etoug Ebe Yaounde, MEVICK Yaoundeand Government Bilingual Practicing High School GBPHS, Yaounde); Representatives of DI Project partners: National Commission on Human Rights and Freedoms (NCHRF), United Nations Center for Human Rights and Democracy for Central Africa (UNCHRD) and Elections Cameroon (ELECAM). The occasion was marked by presentations from students of theDemocracy and Good-governance clubs of the selected schools, presentation of donated books and materials to the regional office (from the US Embassy and the National Commission on Human Rights and Freedoms) speeches, and a visit to the regional office lodged at the multimedia center of GBHS Etoug Ebe.